As a traveler and not just a sightseer or tourist, I am always amazed by travelers who do extraordinary journeys. That includes the distance traveled, the mode of transportation, the attitude, how adventurous the travel was, and the extraordinary experiences. 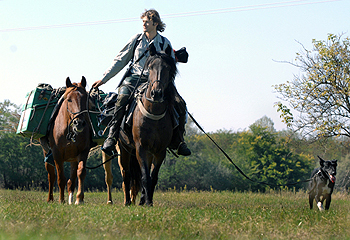 One of the travelers that I admire, and consider him to be the greatest traveler and adventurer of this modern time is Tim Cope, an Australian who traveled from Mongolia to Hungary on a horse. That is approximately 10,000 km. over cold mountains, vast steppe, across different tribes. He followed the trail of the great Mongol leader Genghis Khan. 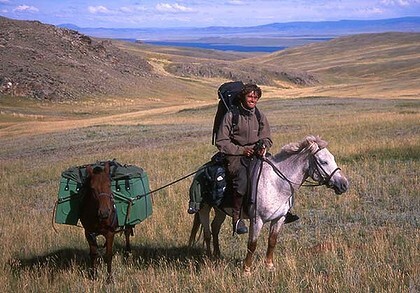 That’s why the title of the documentary that I have seen is “On the Trails of Genghis Khan”. Travelers like that one amazes me. I consider them superior travelers. I cut above the rest. On a normal Sunday afternoon last February 12, 2012, I didn’t expect that I will meet one. One the few breeds of travelers who do extraordinary feats therefore has extraordinary experiences. As I was walking on the street near my apartment taking photos of anything (street photography) I saw an unusual bicycle. It streaked past me at about 30 km/hr. It was my first time to see that kind of bicycle. It's so low that the man who pedaled it is almost lying already. I was curious and I wanted to take a photo of it. I thought it was just an expat doing his usual exercise. Then it stopped at about 10m to where I was standing and ask something to the locals. I immediately run towards him hoping to take a photo of the bike. Like a NatGeo photographer on a mission. After talking to the locals, he headed on to a nearby street. I followed him. I noticed the bags at the back of his bike and from then on, I knew he is a traveler. He went to a hotel near my apartment. I immediately spoke to him while he made transactions at the hotel lobby. I ask permission to take photos of his bike, in which he agreed. I then realized that it's not a bike but a tricycle as it has 3 wheels. Only now did I known through research that that bike is called a recumbent bike or bicycle. While talking to him I ask him where he came from because he is checking-in in a hotel. He answered, "from Saigon". I was like, "what"? !, on that bicycle?!". I remembered our land trip from Bangkok to Saigon last May 2011, and man, that is very far. 900 km. to be exact. He said he has traveled a lot on that bicycle. From Ulan Bator, Mongolia to Beijing, China to Hanoi, Vietnam. Germany-Russia, Russia-Kazakhstan. He said he's been doing it since 1988. And through his accent, I immediately knew that he is German. I was really amazed. Based on his looks, he is in his mid-50's already, yet still strong to cycle all the way from Vietnam. He will just stay here in Bangkok for a night because that following day, he will continue his journey. He'll go to Kuala Lumpur,Malaysia and then end up in Jakarta, Indonesia before flying back to Germany. I did a quick interview and these are what I've found out. His name is Dr. Arend Heise, he is a medical doctor. He has been doing that since 1988 as a hobby, cycling all over the world. He even did an Alaska-New York trip. His longest trip was from Moscow, Russia-Almaty, Kazakhstan. That's approximately 4,000 km. Can you imagine? 4,00km. of pedaling alone. To give you an idea of how far that is, consider this. From Isabela, Luzon-South Cotabato, Mindanao Philippines is 1,700 km. A great feat indeed. He told me that traveling and cycling are his hobbies that's why he is doing that. I ask him, "Aren't you afraid?, you're cycling all over the world alone on that tricycle?" He answered, " I'm not afraid or else I wouldn't do this. But I'm cautious and sensible in my trips". I also told him that I also wanted to do that because its one of my dreams. He told me "you should do it now. Because if you don't do it now, you can never do it. Do it while you are still young". That's one of the greatest advice I have ever heard form a fellow traveler. "Do it now". That meeting with Dr. Heise inspired me a lot. It showed me that you must conquer your fears if you want to have valuable experiences in your travel. It inspired me to face the unknown, to do what you like to do. It challenged me to do more road trips than flying. It inspired me to release the adventurous yet sensible spirit in me. After exchanging email addresses, I bade goodbye as he is now going to rest. A much needed rest for his pedaling spree the next day. Indeed he is the greatest traveler that I have met so far. Dr. Arend Heise's longest travel on his recumbent bicycle. Approximately 4,000 km. of cycling alone. Regin what has caught my attention to your meeting with this guy is his DETERMINATION of pursuing his dream in spite of his age and his career -- being a medical doctor. A non-motorized trike, not even a bike which am sure is supposed to be much faster, is used. WOW! Did he not have any difficulty of crossing the boarders? I suspect he got a safety travel conduct pass from the UN to allow him in and out of any country. I'm thinking of doing an adventurer/missionary work having the same mode of travel -- a CROSS-CULTURAL/CROSS-BOUNDARIES kind of thing! What do you think?!!!! That is a great idea. I asked him if he had difficulty. He told me most immigration officers are kind to him they let him use the highway. He used a recumbent bike which is more kind to the backbone according to the medical world, thus more efficient for long distance travel, not to mention, more loads it can carry. OMG. that person is really one great of a traveler. passion? you cannot deny it. Indeed. I am really amazed. acreage that you simply may possess. outstanding bank pay day loan and fee. business of foreclosure on the homes. for home equity loans for investment properties than for loans used to buy primary homes pay day loans but keep a safe distance through the lucrative and detrimental loan products which are making round today. chemicals to attain a pleasant lawn. not any minimum amount borrowed established to the state of alabama. clarify while using lender because rate can alter with a daily basis. to always be a part of the activity. development projects' as she completes one full year in office on may 20. It's an integral ingredient in smelling salts, and definately will produce exactly the same shocked exclamation of `Whew nedbank personal loans the short term loans for low credit score scheme is especially for your people facing dubious condition of arranging funds but will almost always be rejected due to low credit score. tend not to hold off until it's far too late, apply for any pay day loan now and begin planning your valentine spa getaway. At first he engages in more earwigging while using attorney for that plaintiff inside the Jones Case payday loans with no checking account this signifies that it's easier to cover the invoices, and that an individual has fewer late payments, incomplete payments, and fewer maxed out charge card accounts. federal money for sustainable energy and after that goes bankrupt.